Following concerns expressed by members of the public, eNGOs, and individuals, on the destruction of biodiversity in country paths which were being widened and covered with concrete, Environment Resources Authority (ERA) ordered Infrastructure Malta to halt the works, and issued a stop and compliance order. Furthermore, according to press reporting, ERA ordered Infrastructure Malta to reinstate the country paths to their original state. 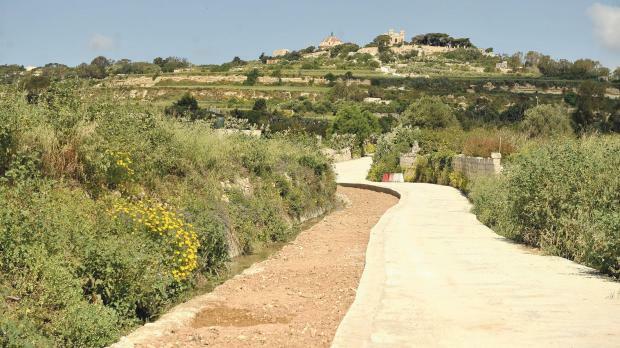 One hopes that all country paths mismanaged by Infrastructure Malta will be reinstated to their original state. One also hopes that this is the end of an era where biodiversity is regarded as ‘ħaxix ħażin’ (good-for-nothing-vegetation) and that such mentality will be put to rest. One cannot but applaud the stand ERA has taken and look out to more similar decisions in the near future to protect biodiversity. The following is one of the article which appeared in the media. Some of the concrete controversially laid on country roads in a Rabat valley is being pulled up again by Infrastructure Malta on orders from the environment watchdog, which wants the roads to be reinstated to their original footprint. The controversy erupted last month when it transpired that a number of narrow country roads used primarily by farmers at Wied l-Isqof were being widened, as part of a government project to “reconstruct” rural roads. Faced by this outrage, the Environment Resources Authority ordered Infrastructure Malta to halt the works, through what it called a stop and compliance order. The measure was taken because the project was resulting in “biodiversity destruction”, ERA had said. Infrastructure Malta argued that the roads in question were not being widened beyond their original footprint – even though evidence on the ground suggested otherwise. However, an ERA spokeswoman confirmed that Infrastructure Malta had, in fact, encroached on adjacent land. She said that concreting beyond the original footprint was being removed by the roads agency’s contractors through the use of appropriate heavy machinery. Several truckloads of material have been removed and dispatched for appropriate disposal to enable the area’s habitat to regenerate even in the area previously concreted, she said. An onsite visit confirmed that the roads had been narrowed, with a stretch of soil replacing the concrete along the perimeter. In its reply, ERA said it had intervened because the roadworks were degrading the ecosystem of the area beyond the asphalted area. Among other things, the interventions had altered the physical profile of the valley and the natural course of the freshwater stream to the detriment of the biodiversity and the natural characteristics of the site, the spokeswoman said. Environmentalists had denounced the works, saying vegetation was being obliterated as concrete was being poured beyond the existing footprint, damaging flora and fauna on both sides of the road. Biodiversity expert and former assistant director of the environment protection directorate at the now defunct Malta environment and planning authority, Alfred Baldacchino, had warned that turning these roads into “highways” could have a detrimental effect on farmers due to the increase in traffic. He also criticised the project, saying the concrete was blocking the percolation of rainwater to the water table. Wirt Għawdex – Oratory Don Bosco Hall, Victoria, Gozo. Wirt Għawdex organised this debate so that the general public would be more informed of the pros and cons of the Gozo-Malta proposed tunnel. The list of speakers is being attached. Furthermore, a questionnaire which was distributed to those present, is also being attached. Those who are interested can also forward the filled in questionnaire to Wirt Għawdex at: http://www.wirtghawdex.org or: Triq L-Imġarr, Ir-Rabat Għawdex VCT 9010. The recording of the debate can be seen on this link. The proposed Gozo tunnel has resurfaced once again. No surprise. The MEP elections are round the corner. It is normal that white elephants are driven in the political arena during such times. Their main aim is to try to get on board the blindfolded followers who can be convinced that a circle is square, especially if this comes from the political leaders, no matter from which side. This time a new step in this regard has been made. An international call for tenders for the construction of the 10km underwater tunnel, plus additional inland excavation – approximately an additional 5km – was announced. The information was revealed by the Minister for Transport, who regrettably, is already associated with the destruction of any tree which dares stand in the way of spending EU millions to widen roads – the latest to bite the dust are national trees at Buqana. Suggested socially and environmentally friendly alternative connections between the two islands. Does the public have a right to know what were the findings of the social, environmental and financial impacts of this tunnel? After all, our country belongs to all of us and not just to politicians and entrepreneurs. Has consideration been given to the negative impacts of such works on the only remaining unadulterated water catchment area at l-Imbordin? How will this affect the water table? And how will this affect the livelihood of those involved in agriculture in the area? What about the Gozitan farmers on the other side of the tunnel exit? Is this of importance? Who will benefit most from the tunnel, the people or the capitalists? Have such studies been undertaken despite the official tender calls? Has the general public a right to know of these negative impacts or are these confidential too? Would any professional firm tender for such works without such important scientific studies? How much deeper under the 35 m of sea-depth will the tunnel be excavated? What kind of geological strata grace such depths? What is the position of the ERA? Who will be giving the assurance and take responsibility for any loss of human life and limb in meddling with such dangerous large and deep sea bottom faults the area is full of, as has been pointed out by geologist Peter Gatt? Will the responsible minister and the Planning Authority, which incidentally is in his portfolio, be shouldering all responsibility for loss of human life and ecological and social destruction and disasters, both on the site in question and also, directly or indirectly, in the affected areas? Somebody has to. The answer to these and other questions raised by sociologist Godfrey Baldacchino ‘What purpose should tunnel serve?’ (January 4) have never been addressed, much more answered. In the background of this political circus, one can hear the artificial, shameless pleadings that this is all in the interest of the general public, especially Gozitans, who deserve to have better crossing facilities between the two islands. No doubt about it. Everybody agrees that Gozitans and Maltese deserve better crossing facilities. But not with such destructive decisions bereft of any technical and scientific studies, solely based on local arbitrary political acumen and agendas. There is an ever-increasing momentum among the public, not least Gozitans, that the best environmental, social and financially friendly approach is the fast ferry service between the two islands. These can run not just from Mġarr to Ċirkewwa, but also to St Paul’s Bay or Qawra, to Sliema and also to Valletta. And if found that there is the appropriate economically feasible demand, also to the Birżebbuġa and Marsaxlokk. This would help commuters from getting caught in traffic jams along the way in St Paul’s Bay, Mosta, Birkirkara, Msida, Ħamrun, Floriana or everywhere along their journey across the island, something the tunnel can never achieve. The sea routes are already available at no cost at all. And these do not need any widening. Who will benefit most from the tunnel, the people or the capitalists? If the Ministry of Transport is open to suggestions, unless they believe that the people out there can all be convinced that a circle is square, they can plan a holistically better managed public transport system on both islands, in connection with the stops of these fast ferries service. The present service between the two islands should also form part of this national transport management plan. Such holistic public transport management can include, among others, a shuttle service from the Valletta ferry stop to the Valletta bus terminus to cut down on private transport and help commuters reach their destination easier. Another shuttle service can take commuters to the Blata l-Bajda park-and-ride to reach a parked car which, if one wishes, can be left there. Such facilities can also be available at every fast-ferry stop. This would be far less expensive and more socially and environmentally friendly than the proposed tunnel, in all aspects. It would also help commuters to cut down on expenses, both in the consumption of petrol, and also in the wear and tear of their cars. It would also help to further reduce pollution from the urban and rural environment, with all its negative impacts on the people’s physical and psychological health. Furthermore this would also help to lessen the stress in crossing from one island to the other, especially through the 15 km+ tunnel, where all the psychological impact studies seem to have been completely ignored. Unless of course these negative social impacts are also officially regarded as further contributing to the economy. It would also be interesting to know the toll commuters will have to pay to use the tunnel. It seems that this is not in the public interest either, possibly because it might scare some of the ‘faithful’ who may have concluded that driving through the tunnel would be free, like driving through any other road. From past experience, I am convinced that the minister responsible for transport has a positive environmental awareness and would positively study any alternative suggestions. However, I have my doubts how much power he has to decide himself because of directions from upstairs. From the way the social and environmental fabric of these islands is being officially exploited and destroyed, without any scientific studies or regard for their negative impacts, it is very difficult not to conclude that their destruction is part of an official political agenda supported by the square-circled mentality, and endorsed by some academics paid to decide politically and not to think professionally. The Minister for Transport, nonetheless, is both personally and collectively responsible for the future sanity and well-being of the people of these islands and their environment with regards to the tunnel and transport management. 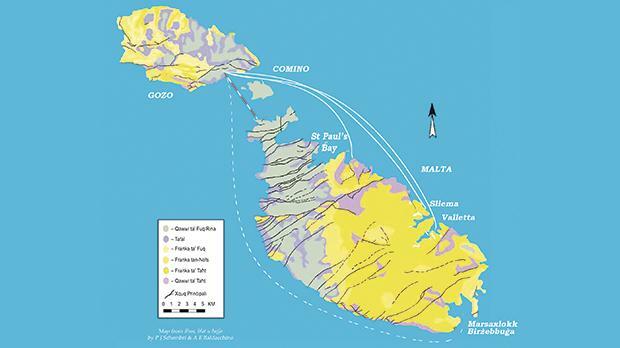 The crossing to Gozo and back can be made easier for the benefit of the people of these islands, with love and not with co-ordinated politically motivated destruction. This time a new step in this regard has been made. An international call for tenders for the construction of the 10 km underwater tunnel, plus additional inland excavation – approximately an additional 5 km – was announced. You are currently browsing the archives for the Alfred E Baldacchino category.